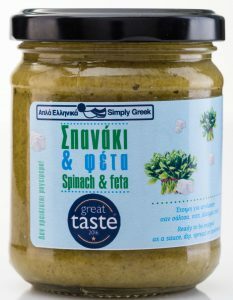 Greek Spinach Pie in a Jar!!! If you have been to Greece, you must have tried the spinach pie, a luscious pie with spinach & feta cheese. A combination loved by all. In this spread, the spinach blends most perfectly with the cured cheese. Enjoy as a dip, a condiment, with mashed potato or baked potato. Also great with pasta or on pizza! We always look out for those who enjoy a spicy kick! We wanted to offer them a spread to use and enjoy with almost everything. We use sweet red peppers as a base but then fire up the flavour to create an eye popping but delicious experience. Don’t blame us… you have been warned….! Rakomelo is a traditional Greek drink that is enjoyed cold or heated before or after a meal. It is made with Tsikoudia, an ouzo like drink without aniseed and honey. Here we have added it to our sun kissed tomatoes to create a mind blowing experience! The sweetness of the tomato adores the honey based drink and together they offer an irresistible flavour. Spread it on sandwiches, use a condiment with cheese and cold cuts, use as a sauce with pasta, meats and poultry, use as a dip, or even a pizza topping! The peas combine with incredibly beautiful mint with gives a fresh aftertaste making this culinary experience a sheer joy. So incredibly versatile, you can enjoy it as a spread, as sauce – even with pasta, as a dip. As a condiment it is superb with fish, seafood, meats, and vegetables. We never leave the heat lovers unsatisfied!!! This is traditional spread/dip made with the glorious traditional cured Greek cheese, feta, tomato & a spicy kick. Awarded for its Great Taste, it is so versatile you will enjoy it everyday with every dish! YES, we have put the world’s favourite salad in jar!!! 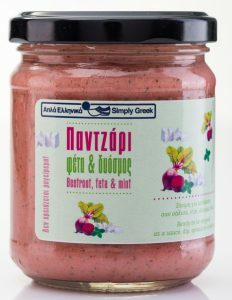 All the luscious flavour and uniquely robust taste of the real traditional Greek salad in a jar! With a twist of the lid you will smell & feel the aroma and the essence of Greece and Greek cuisine. You can enjoy it as a spread, a dip, a condiment or a pizza topping even! As a pasta sauce it will blow you away as it did the judges who gave this gem a Great Taste Award! Mind boggling indeed, but yes, the most famous traditional Greek dish in a jar! Many poked fun when reading the label but were stunned after trying it! We have created the flavour of mousaka with aubergines, tomatoes and nutmeg. A truly Greek treat! We all enjoy grapes with cheese and there was our inspiration for this wonder. Sweet raisins combined with the magnificent cured Greek cheese, together blending to give us a simply phenomenal result. As a condiment with all meats and poultry, cold cuts it is exquisite; with cheese it is spectacular. Just out of the jar… it is captivating! The fig, that wondrous summer fruit of the Mediterranean with its mesmerising flavour… a beautiful inspiration for creative tastes. Here we have paired it with red wine and the result is just magical. To be enjoyed with cheeses, cold cuts, meats, poultry… although we should warn you that it can be addictive and this might lead to consumption straight out of the jar!